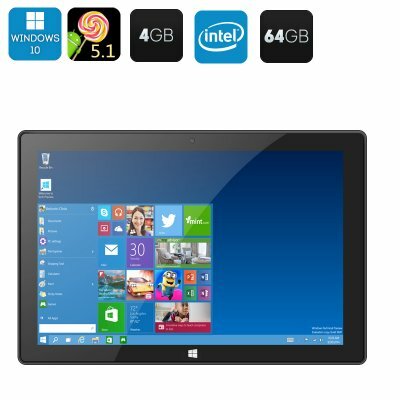 Successfully Added Windows 10 + Android 5.1 Tablet PC - 10.1 Inch Screen, Cherry Trail CPU, 4GB RAM, 64GB Memeory, Front + Rear Camera to your Shopping Cart. Don't compromise, have Windows and Android on the same device for all your user needs. The windows 10 OS brings all the tools for a proficient work machine while the Android 5.1 system offers everything the Google play store has on offer such as games and media players. The 64Bit Intel Cherry trail CPU can hit 1.84Ghz and with 4GB or RAM backing it up you get a seamless performance no matter what you're doing. This energy energy efficiency tablet is the perfect work mate and can optimize its performance to suite your needs and save power when its top speed isn't required. The 1280x800 resolution screen offers crisp pin sharp images that will make games and movies really pop with details. this allows you to immerse yourself in games and get the most from your on the go movie experiences, great for taking the stress from those long commutes or chilling out in an evening and blocking out all the distractions around you. Offering you 64GB of onboard storage and 64GB micro SD card port this tablet brings enough support for both OS systems with enough left over for your full media library. Wi-Fi and Bluetooth connectivity make wireless communications and data transfer effortless. This 10.1 inch dual boot tablet is a great way to take all the fun and excitement with you on your next trip, no matter how long it may be. It comes with a 12 months warranty and is brought to you by the leader in electronic devices as well as wholesale tablet PCs..
his 10.1 inch dual boot tablet PC comes with Windows 10 and Android 5.1 OS providing a great mobile entertainment for your next trip, no matter how long it may be. exelent service with very good product and quality of goods. Got everything as described. Will definately do business with this company agian.